Construction I wish.. (only for real and unreal) followed by Past Simple and Past Perfect. For foreign students of English. Can be followed by making the questiions and discussion! This downloadable worksheet is best suited for business/professional students, high school students and adults at Upper-intermediate (B2) and Advanced (C1) level. 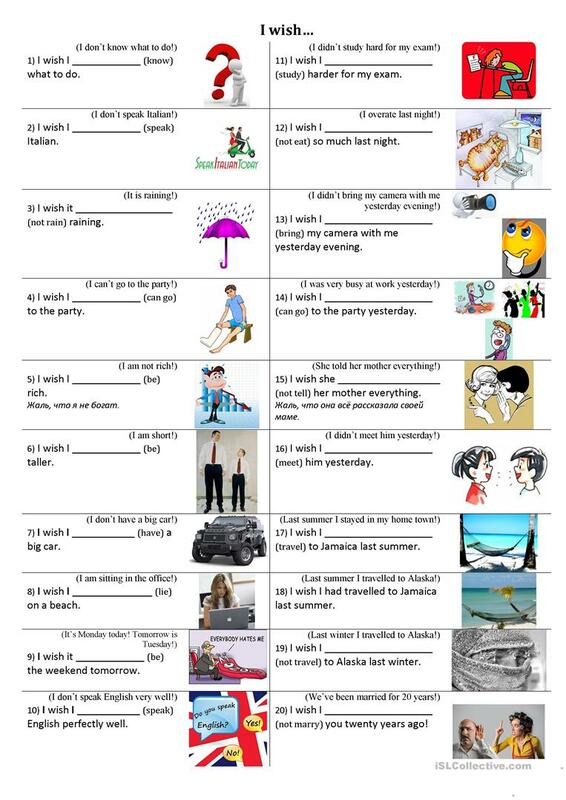 It is aimed at practising Conditional II (second) - would, Conditional III (third), Conditionals, Conditionals - I wish / If only and Subjunctive mood in English. The answers are provided, too. My students call me Miss TN as it is short and quicker for students to call me. I work with students (starting age 4,5 and the eldest students are over 50). Sometimes I have to be tough for the sake of the language environment that I desperately try to create so I speak only English in class.